Brainstorm Essential Oil Blend has a soothing, awakening floral scent, featuring sweet and flowery top notes with warm, plant-like bottom notes. The oil features a blend of Ylang Ylang, Melissa, Sandalwood, Frankincense, Cedarwood, Lavender, and Helichrysum italicum . 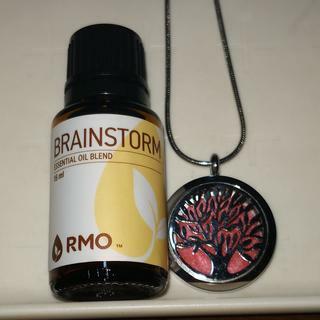 Brainstorm Essential Oil Blend is part of the Rocky Mountain Oils Energy collection. Use Brainstorm to help focus your thoughts, whether you’re studying or meditating. The oil also helps promote peace and balance in frustrating situations, and may help clear mental cobwebs. Melt shea butter and add FCO. Blend in essential oils. Put in container and allow to cool completely. Close lid and label. Massage into shoulders and neck before school and before studying. Click here for the GC/MS test results for your bottle of Brainstorm Essential Oil Blend. This is my all time favorite of ALL of my essential oils! It's my most loved and treasured oil due to how well it uplifts and focuses me when I use it... I absolutely LOVE it!!! I was not sure about this oil when I first recieved it. When I started using it I fell in love. The fragrance brought back some wonderful time in my life. Love how Brainstorms keep me focused at the task at hand. A drop a day in my personal diffuser, helps me to keep focus throughout the day. This is a great blend. Brainstorm is a great blend for people who need to balance high note chemistry with lower notes without the coincidental fatigue. I strongly recommend this oil for highly active, high strung individuals to balance focus and concentration with their high active nature. This is GREAT for the beginning of the workday ! Love it ! THE NINE OILS I ORDERED ARE FOR GIFTS SO I DO NOT KNOW HOW TO RATE THEM EXCEPT 5 STARS AS THEY WERE REQUESTED BY MY DAUGHTER AND 2 GRANDSONS. I love the smell. Do you have a recipe to make a perfume with it as Christmas gifts? Brainstorm is my new favorite! Love this blend! I diffuse it throughout the day and it is very energizing! I love this blend. It has such amazing oils in it and it really helps give me clarity during a busy day. It smells amazing so I frequently apply it before I go to work. Brainstorm is one of the best blends for helping me get a good night's sleep and waking up clear headed. I can tell the difference when I use an alternate blend. Brainstorm is just better for me. It also has a wonderful aroma that makes the whole house smell refreshed. I work full time and go to law school at night, so I'm constantly exhausted and need to concentrate through it. I bought Brainstorm to help with studying for finals. I diffused it first and did not like the smell at all. But I made myself a roller of the oil and I LOVE it. For whatever reason I love the scent as I roll it on my temples and the way it helps my brain focus on the task at hand and sort of filter out the distractions. I'm SO GLAD I bought this! As with all of Rocky Mountains oil I love the fragrance and can take the cap off and inhale to get my mind headed in the right direction. Great addition to my oil collection. This oils smells very nice. Helps me focus in the morning. What a constant source of joy this blend is! Mind you, I've been diffusing this and our diffuser isn't the best one on the market. I'm surprised it doesn't chortle, cough up, and spit out puffs of oil blends. Still, there's always a brew of some sort of essential oil blends going on at our house. We're mad scientists pretty much. Still, this one is perfection. No tinkering required. I've tried other RMO blends (like the Baby Skin and I wasn't over the moon about it) but this one... Perfection. Like a cup of coffee for the mind and sweet honeycomb for your soul. It's a perfect, feel-good blend. And yet, it gives you a little kick. I would recommend this along with your coffee in the morning, whenever you seem to hit a wall mentally, if you suffer from writer's block, or even if you're just feeling in the dumps. Honestly, if you wanna just buy this for the smell alone... I think this is an RMO must-have. This should be the crown jewel of RMO's collection. Put this up there with Frankincense for versatility and benefits. Wonderful oil to diffuse. Calming, soothing ND WARM. Brainstorm is a great way to start the day, it helps with concentration and gives you a good feeling thru the day. I have not used this yet enough to make a solid review. However, I will say that I can compare using RMO to DoTerra as that is what I have used for the past year. So far I am delighted with the quality and the price and the effectiveness. I look forward to more experience and am highly recommending these oils to my friends and clients! Great product, worth the extra price! I like to diffuse this as part of my morning wake up. It is stimulating and positive. Brain fog seems to gently dissipate. I love to diffuse it in my office, bring in calm and peace. Help me tackle endless work. I made a roll on by mixing it with a carrier oil as a perfum. Very uplifting the mind in the rainy season that we are going through. As I have grown older the brain doesn't work as quickly as it used to. It seems to help with a bit of the brain fog. I apply it at night and sometimes in the morning. It smells really good. I've been using this along with Attention Assist for help with focus while studying. I think it helps a bit but it makes me a tad drowsy especially when mixed with Attention Assist in diffuser. I'd prefer if Lavender was left out in this blend. Great for use just before bed as it definitely relaxes you. I am still testing it out. I am working on some important papers and have it diffusing. I seem to be staying focused and not going completely apoplectic! Amazing scent for both male and female. Invigorates and helps focus. I used this oil to get through my board exams. It helped my energy through studying and I believe gave me more focus. Recently, I purchased this essential to assist during work and study times. The aroma is amazing!!! Also, my daughter tends to study with more intensity and overall ease. AWESOME! I can really smell the Ylang Ylang, which is good because I like it. I have been diffusing Brainstorm at work to help me concentrate and I have noticed a little bit of difference. Everyone that comes in my office wants to know what the pleasant smell is. It seems to keep my mind at ease. I'm loving Brainstorm! Smells great and helps me focus on the task at hand. I will reorder! I really wanted to like this one, but couldn't justify the cost. Not particularly noteworthy. I was so hopeful after reading a few of the reviews that this would work. Sadly the smell is overpowering and I do not like Ylang-ylang which overpowers the rest of the scent. A waste of money. What is the difference between Brainstorm and Attention Assist? BEST ANSWER: Great question! While both have similar therapeutic properties, they are part of different collections. Brainstorm is part of our energy collection, while Attention Assist is part of our Mood collection. Brainstorm has a more floral scent, while Attention Assist has a more strong woodsy smell. I use both oil blends regularly. Depending on the day, one blend works better than the other and vice versa. Guess it is all in how my mood is going to be that day. Is this blend suitable to be diluted and topically applied for children under 10 years old? BEST ANSWER: Great question! Each oil in this blend is safe for children 2 years and older. For topical application on children, we would recommend diluting it at a 2% dilution rate. This would be 3 drops of Essential Oil per 1 teaspoon of carrier oil. Below I have provided links to our Kids Safety page as well as our Dilution Rates page. New to oils - I notice that this is 15ml. So does that mean that the carrier oil has already been added? I ask because I see that the other companies that have a similar blend have this in the 5ml. If its already with the carrier oil, does that mean it can be applied straight from the bottle? thank you. BEST ANSWER: Brianstorm is not prediluted. Anytime you are trying an oil for the first time we do recommend diluting the oil further. It's a blend of different oils but no carrier oil that I can see. When you click on the oil it will show you the back label which lists the ingredients and also lists the carrier oil if there is one. No carrier oil, just the blend of essential oils listed. It can be diffused, blended with carrier oils to make a roll on or can be inhaled right from the bottle. For each oil under the elements tab it will tell you what oils the blend contains. If it has a carrier oil it will also say that here. This one is neat. Yes, we use Brainstorm straight from the bottle. Not always. Check the ingredients. BEST ANSWER: Great question! All of our essential oils and blends can be diffused.